46 swimmers competed in our 9th Annual Novice Gala at the Arena on Sunday, which saw a club record broken! It was lovely to welcome swimmers from iSwim, our learn to swim section, for our Novice Gala this year too. All events were 25m giving everyone the opportunity to try something, plus the 50m freestyle. It was in the 50 free that Ashton Netherwood broke the boys 8 years & under Club record in a time of 34.77 seconds. Fab – don’t forget to submit your record claim Ashton! 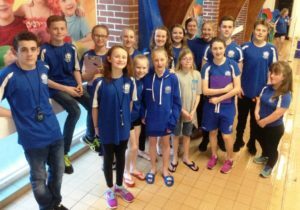 The gala was run by swimmers from all the other squads, with a little lovely adult help from Helen, Dean, Andrew, Darren, Tim, Leanne and Zoe. This was a ‘teaching’ gala, so we had a demonstration from Abby Smith before every race. Our announcer for the gala was Tegan Prior, with referee Heidi Cameron and starter Caitriona MacLeod. Will Le Merle and Georgie Howell were both judges. Chief timekeeper was Stephen Redman, along with timekeepers Max Williams, Euan MacLeod, Ella Napier and Marissa Netherwood. Heat marshalls were Abi Pendleton and Ella Thornburg. Emily Carman was our ‘runner’. We hope you all had a lovely gala and were pleased with your times! Well done to everyone!